The 2017 League of Legends World Championship (LoL Worlds) is the biggest eSports tournament of competitive LoL in Season 7. LoL Worlds 2017 will close up the competitive Season 7 all over the world and takes place from September 23rd 2017 to November 4th 2017 in the country of the rising sun – China. Because of the newly added Play-In stage the event will now last one week longer than in the previous years. With the Mid-Season Invitation tournament 2017 (MSI) as role model the League of Legends World Championship 2017 will also cancel all qualification tournaments for the Wildcard regions. These contenders will participate with teams from China, Taiwan, Europe and North America in the all new Play-In stage of Worlds 2017. While the number of Wildcard teams for the main event changes, the worldwide dominance of the Korean teams remaimns the same and we will probably see another episode of South Korea against the world at the greatest international event in professional League of Legends. Many months before the start of LoL Worlds 2017 the Korean teams are already and still the favorites for climbing the next world champion throne while teams from other regions like Europe's and North America's LCS 2017 have to step up to get to the top of the table. Below you will find everything that is to know about Worlds 2017. Take a look at the schedule and standings or find out about how teams qualified for the tournament. Stay tuned for the latest updates on the 2017 LoL World Championship! After the group stage the playoffs will take place from October 19th to November 4th, consisting of quarter finals, semifinals and the great final. All these games will be played in a best-of-5 single elimination format and between each stage the teams will have a break to prepare for the upcoming and exhausting games. The 16 best teams of the world will play in the group stage from December 5th to December 15th. As usual there will be four groups consisting of four teams and the two best placed teams will move on to the playoffs which will start with the quarter finals. Like in previous years there will be a double round robin format with best-of-1 duels to eliminate 8 teams from the tournament.Without possible tiebreakers there are 48 matches on the schedule of LoL Worlds group stage. Read more about the group stage #2 of the LOL World Championship 2017. In the first stage of the event, the teams fight for the remaining four seeds of the group stage. It will be held from September 23rd to September 29th and will consist of two rounds. Round 1: The 12 teams will be divided into four groups. After everyone has played each other, the best two teams of each group will move on to round 2. Round 2: The remaining 8 teams will be randomly allotted to each other in a way that there is always a first placed team playing against a second placed team of round 1. The winner of these matches move on to Worlds 2017 group stage. While the main part of the games will be distributed among the big eSports arenas in Wuhan, Shanghai and Guangzhou, the LoL World Championship 2017 finals will take place at the national stadium in Beijing which is famous for the sportive events during the Olympic games in 2008. From last year’s location in Los Angeles with a capacity of about 20.000 people we are heading to a stadium with a capacity of 80.000 people – eSports is definitely growing everywhere. The best teams in the world competing at the most important League of Legends tournament of the year, many activities for all the fans during the event and magnificent live acts rocking the stages – in conjunction with some of the most beautiful cities in the world China is definitely worth visiting in autumn 2017. If you want to follow action of the World Championsip live you can find out more about the 2017 LoL Worlds tickets here. This year the tournament format of the World Championship has changed and Riot increased the number of participating teams from 16 to 24 to include all Wildcard regions. First of all, the Wildcard teams and one team from each Europe, North America, China and Taiwan are divided into four groups of three challengers. According to the LoL Worlds schedule 2017 every team plays against the other teams of their respective group two times in best-of-1 series. The two best teams of each group move to the next stage where for example the winner of group A plays against the runner-up of group B in a best-of-5 series. The four remaining victors of these duels are directly qualified for the group stage of the League of Legends World Championship 2017. Besides these four possible seeds the best Wildcard region of the Mid-Season Invitational 2017 will gain a fixed spot for the group stage. Consequential there will be at least one and at most five Wildcard teams after the Play-In stage of the tournament. Second seed goes to the team with the most Championship Points throughout the year 2017. These points will be distributed based on the placements in both splits. The minor regions only have one seed for the World Championship 2017, the champion of the Summer Split 2017 directly qualifies for Play-In stage of the tournament. In case of the lucky region that has got another seed due to the placement at the MSI 2017 the Summer Split champion directly qualifies for group stage while the team with the most Championship Points may participate in the Play-In stage. This year there will be 24 teams at the League of Legends World Championship. 12 teams are already qualified for group stage, the other 12 have to go through the Play-In stage to fight for the remaining four seeds. For the first time the region of Taiwan/Macao/Hong Kong (LMS) has a third seed with two of them being qualified for the group stage and the last seed compete in the Play-In phase. Details about the teams of 2017 LoL Worlds. The year's tournament will consist of 24 teams instead of 16 as in the last years. Half of them start at the Play-In-Stage and only 4 will qualify for the Group Stage, where the other half of the teams is already waiting. This means that there will be 16 contestants at the Group Stage. Read more about the changed format for LoL Worlds 2017 here. The eight last mentioned regions have one seed each in the Play-In stage, only the best performing team of these regions at the MSI 2017 gets an additional seed which is directly qualified for the group stage of the LoL World Championship 2017. Besides the glory of being the best League of Legends team in the world there will also be a huge prize pool to be distributed among the teams. The exact amount of prize money for each team and in total is not known yet. It is expected that the total prize money will in any case exceed USD 5 million. We will keep you updated with any news regarding the prize money. 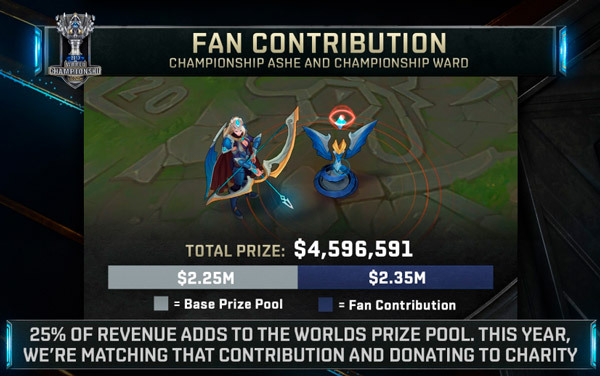 Update: In the meantime Riot Games has announced an interim result in Championship Skin sales and the current prize money skyrocketed up to $4,596,591 USD which will continue to rise until November 6th. The exact distribution of the prize pool to the participating teams can be found in a separate article on our site. Of course our renowned eSports bookmakers will be present at the biggest League of Legends event of the year with betting odds for all games. 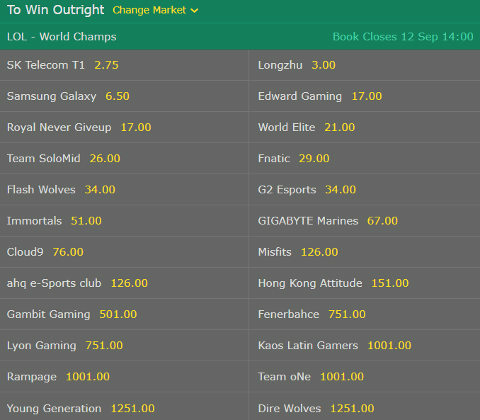 Besides the option to directly bet on the outright winner of LoL Worlds 2017 there are many other possibilities to place bets e.g. on the number of Barons slain or the team who first gets 10 kills. The odds will be available shortly after all participating teams have been announced. 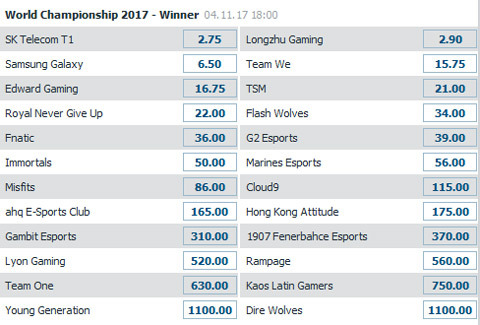 You will find a comparison of all important betting odds right here as usual, or check this resource for betting on LoL Worlds 2017 for further details. You can find out more about betting on League of Legends here. All matches of Season’s 7 World Championship will be streamed live in various languages and on several platforms. You can watch every game of the event for free! You will be provided with information regarding casters, analysts and hosts of Worlds 2017 as well as a complete streaming schedule with starting times and results as soon as they are announced. The link to the official Twitch.tv stream of Riot Games will also be found here.